I’ve been a big defender of plastic grocery store bags for a long time. In fact, last year I challenged readers to tell me why the humble plastic shopping bag is still maligned by so many people. Now I may be just a wee bit biased, but I think I made a very compelling case when I explained why plastic bags are good. Yes, I mentioned that they are arguably environmentally friendlier than paper bags. Yes, I mentioned how they minimize the number of trips I have to make when I get home and need to tote my groceries from the car to the house. I even remembered to note that they are durable, lightweight, moisture resistant, and reusable. However, as my readers reminded me the last time, what I failed to mention was that the poor, pilloried plastic shopping bag is also extremely versatile. 2. When you ball them up they can be used as mattress or pillow stuffing. 3. If you have a broken arm or leg, you can use plastic bags to help keep the cast dry while taking a bath or shower. 4. Plastic bags are also great for holding dirty diapers. 5. Line your cat’s litter box with them. 6. Speaking of pets, plastic bags are perfect for picking up dog and cat poo. 7. Use them in your luggage to keep your wet clothes separate from your dry clothes, and your clean clothes from dirty ones. 8. When traveling with a suitcase, plastic bags can also be used to protect your shoes from scuffs — or keep stinky shoes from affecting your other clothes. 9. Most everyone knows you can use them as a simple lunch sack. Or do they? 10. Got a leaky bottle or jar? Use a section of plastic bag as a seal prior to screwing a cap onto the container. 11. If the forecast calls for frost, you can protect delicate plants by placing a plastic bag over them the night before. 12. Plastic grocery bags can be used as packing material for fragile items. 13. To prevent messy leaks when defrosting meat, place the meat in a plastic bag, along with a paper towel. 14. For cars that are parked in the open, you can place plastic bags over the side mirrors and wiper blades to keep them free from snow or freezing rain. 15. Painting a large room and need to take a break? Wrap your paint brushes and rollers in plastic bags to keep them from drying out so fast. 16. Plastic bags can be used as cheap disposable gloves for handling unpleasant things. 17. They’re also great for storing old rags. 18. Use them as a non-stick surface for rolling out dough. 19. When I’m tasked to watch a neighbor’s home for an extended period of time, I use plastic bags to hold their mail until they return. 20. And nothing is better for tossing out moldy fruit or stinky refrigerator leftovers that, um, need a shave. 21. Use plastic bags to make kitchen spills easier to clean up by placing all your wet paper towels in them. 22. In a pinch? When traveling on the road and you’re miles away from the nearest facilities, you can use them as emergency toilet paper. 23. You can also use them as a makeshift shoe horn. 24. 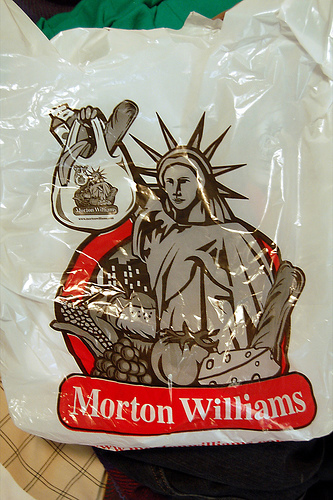 Plastic bags can be used to coat chicken or beef with flour prior to cooking. 25. While you’re in the kitchen, keep in mind that you can wrap your homemade bread in a plastic grocery bag. Those who know say the bag will help keep the bread fresh while still allowing it to breathe. 26. By the way, if you find yourself out of bread crumbs, you can also use them to crush crackers without making a mess. 27. When you’re working the garden, try wrapping some plastic bags around your knees to not only keep them dry and clean, but also provide a little extra cushiony comfort. 28. Oh, and while your busy tending to the yard, don’t forget you can also use plastic shopping bags to collect those smaller yard clippings. 29. Plastic bags are often used as emergency rain gear. 30. You can also use them to bring home your wet clothes. 31. Hopefully, you’ve also kept a few extra plastic bags in the car and near your home’s front door for storing those muddy shoes. 32. And, hey, even if it isn’t raining you can still use them to waterproof all kinds of stuff. 33. You can use plastic bags to store Christmas wreaths and decorations. 34. When traveling, store perfumes and other toiletries in a plastic bag to prevent leaks from making a mess. 35. Got a son or nephew who owns a G.I. Joe? Plastic grocery bags make great parachutes for them! So there you have it! That’s 36 uses for plastic shopping bags, and I know you folks probably have a bunch more that I failed to mention. Now, if you’ll excuse me, I’ve got a little shopping to do. And when it comes time to choose between paper or plastic, I think you all know what I’ll be asking for.